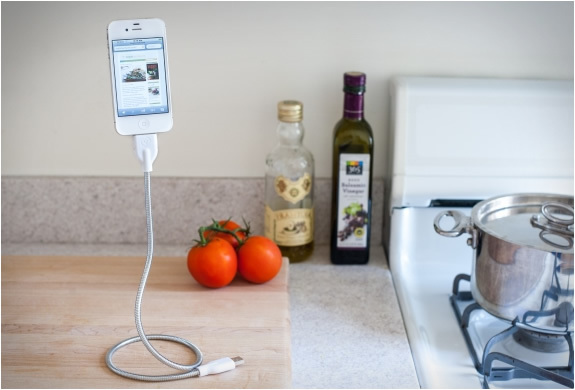 Bobine, rigid cable to charge your iPhone, amazing!! Thinking in design, Bobine occurs with simple function of being a cable to your phone. Plain and simple, is that you can use with any cable cover (even with the phone always comes one included), but not in the same way. Bobine cable is flexible yet rigid, designed to place the phone in multiple positions. May be subject on the table vertically, horizontally or perhaps to see a video for a long time. The cable is USB on one side, perfect for use as a charger, and is available in two versions for iPhone and other phones using the microUSB standard, mandatory in the European Union .